Be Hello loves! I just want to share with you that I commute to work everyday. Having said that, one rarely sees me wearing skirts or dresses in the office. The only time I get to dress is when I perform in band gigs. Yup that's true! 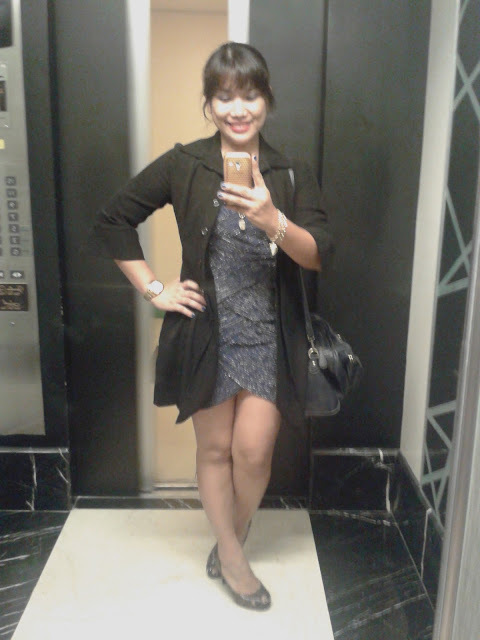 Shy kasi ako sometimes to look so girly and call attention in the office. Plus, it's so hard to commute and be conscious at the same time about the hems of my skirt while walking or sitting. For the past weekends of April to July, I've been wearing cocktail dresses for our performances in Luxent Hotel in Quezon City. Sometimes feeling celebrity lang because I cannot repeat dresses so lately I have been scouting and scoring quality dresses on sale! Alam niyo naman muthers, ayoko naman mapunta ang talent fee ko para lang pambili ng damit. So ang requirement ko to purchase a dress ay dapat sale siya. :-) Unless may mag-sponsor diba? I've been getting my dresses lately from People Are People. The dresses I buy are on their sale rack and here's one of the 3 dresses I already bought. Which by the way, hubby said is too short, with matching kunot na noo and salubong na kilay. So you think it's too short nga? Til my next Practical Fashion feature loves!